While Nanak borrowed much from other religions specially Upanisaidic Hinduism and Islam, he doesn’t seem to have indicated any direct influence of the Buddha. The land of Guru Nanak- the Punjab- was also the land where Buddhism had once flourished- Gandharva, and as the historian Romilla Thapar has pointed out- Islam and other non- Hindu religions have an unusual overlap with the geographical areas where Buddhism had once reigned. 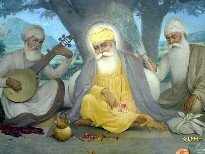 Some of the janam sakhis– the stories of uncertain origin related to Guru Nanak bear a strong similarity to some of the stories that one heard about the Buddha as well. The two, however, seem to have encountered each other in Tibet when Guru Nanak, also called Nanak Shah, visited the place in the 16th century. Harjinder Singh explores and explains why Guru Nanak is referred to as the Guru Rinpoche or Nanak Lama in Tibet, some of the tales he recounts are mythological but fascinating since this is an area that has not been sufficiently explored in both thelogical and historical studies. If you go to the Golden Temple one of the most interesting things you will observe are some Tibetan pilgrims who come to pray there, bowing down at each of their steps. These people are Buddhists who may belong to one of the numerous sects of Tibetan Buddhism, who regard Guru Nanak as Guru Rinpoche. Guru Padmasambhava brought Buddhism to Tibet and they regard the Guru as a reincarnation of the precious one, ‘Rinpoche’…. 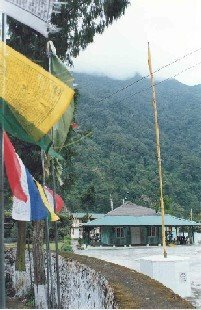 (The picture above is) of gurdwara in Sikkim India where locals hang scriptures along with Nishan sahib and hang sikh scriptures in prayer in bodhic style. Your point about hanging sikh scriptures in prayer, has someone validated this ? I have visited the Gurudwara pictured above ( infact this picture looks a lot like the one i took there ..anyway.. ) and from what i can remember the prayer flags were just like any other buddhist prayer flags elsewhere. I dont recall seeing any prayer flag either in Gurmukhi or it ever being mentioned that these were Guru Nanak’s teachings in the local script. However i would be very interested in knowing if any Gurbani ( what u refer as Sikh Scriptures ) is on the prayer flags. You may like to mention the point about the scriptures at the blog from where the quote is taken. If the picture is indeed the one that you took, I will be happy to credit it to your blog/ url. I am not surprised at the lack of Buddhist influence on Sikhism. The reasons are manifold. First is the conceptualisation of God. 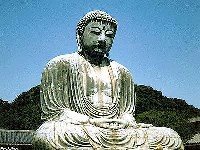 Buddhism does not really believe in God, it is essentially nontheistic. In the case of Sikhism, the religion is theistic..The very first word of the Sikh scripture is ‘God is One”. A substantial part of Sikh prayer is singing praises about God – the concept of Vismaad (awe, wonder and ecstacy) about God and his creations. Read Asa di vaar — vismaad nad vismaad ved, vismaad jia vismaad bhed (p.463) – meaning Wondrous is the sound, wondrous is the knowledge, wondrous are the beings, wondrous are the species. Even the word Wahe-guru is about praise of God. Second, is the concept of suffering. The idea of world being full of suffering is again alien to Sikh thought. Sikhs claim the opposite – Eh jag sache ki hai kothri, sache ka vich vaas (Asa. M. 5, p.378, SGGS) meaning this world is the abode of the True One, and truth or True One lives here. Buddhism on the other hand consider world to be a place of suffering. Though I must add that Sikh theology also suggests that it is in times of suffering, people remember God. Also, the concept of “attachment” seems similar in both religions. Third is the practice of Buddhist monks, or bhikshus. Bhikshus leave their family life, like an ascetic or live in monastries. Sikhism is the religion of the householder. Fourth, Buddhism is clearly pacifist in nature. Sikhism is anything but pacifist. Guru Nanak, founder of Sikhism said very clearly, Et marg per dhareeje, sir deeje, kaan na keeje (p 1412) – when you step on this path, sacrifice your head, and do not care about the rest. While Buddhists would prefer to be killed, rather than kill, Sikhs are required to fight whenever they see any opression. Lastly, Sikhism is a revealed religion. Guru Nanak says this and so do other Gurus. Remember daily prayer, the ardas Aagya Bai Akal Ki, Tabhi Chalayo Panth. Hence if the religion is revealed, the question of “borrowing” from Upanishad or Buddhism or Islam does not arise. The terminology could be borrowed. But the experience of the prophet is personal. Buddhism and Sikhism indeed have a lot in common. Firstly, our beloved Gurbani says “Man Jeet-ai Jag Jeet” (Pauree 28, Japji Sahib) (meaning, “if you can tame your mind, you can win the world”). This is really the essence of Buddhist teachings as well. Shamatha and Vipashyana meditation methodologies are really all about how to calm your thoughts (particularly negative thoughts – also known as “panj vikaar” in Sikh practice), and embark on a journey of self-transformation. This journey starts from the impure state of mind and if the practitioner is really diligent and honest to the practice – results in the achievement of a pure state of mind. The Buddhists liken this “awakened mind” to that of a lotus blossom in mud and filth (In Gurbani: “Anjan mah Niranjan rahiye. Jog Jugat iv Pai-ye” ਅੰਜਨ ਮਾਹਿ ਨਿਰੰਜਨਿ ਰਹੀਐ ਜੋਗ ਜੁਗਤਿ ਇਵ ਪਾਈਐ ॥(SGGS ang 730) – meaning that our pure, clear and brilliant nature of mind is the true nature, and can persist in this world full of lies and filth (“Nijhar Jhar-ai Sehaj Dhun Laage, Ghar Hee Parcha Pai-ye” ਨਿਝਰੁ ਝਰੈ ਸਹਜ ਧੁਨਿ ਲਾਗੈ ਘਰ ਹੀ ਪਰਚਾ ਪਾਈਐ ॥ SGGS ang 730) – meaning that the nectar of brilliant clarity of mind and unblemished awareness rains down, the celestial tune resounds within oneself and thus deep and profound wisdom is found within. My suggestion to all kind readers and commentators is to research the true message of both GurSikhi and Buddha-Dharma. Guru Nanak and Guru PadmaSambhava brought the same message to common lay people – Get out of superstitions and ritualism, and get on the path of realizing the true nature of mind, and transform one’s honourable existence into a kind, peaceful, and satisfied one. Respect everyone, and reveal to them the true message of Sikhi, and if you find something worth learning from another culture or system of wisdom, don’t hesitate. Thanks for your insightful comment. I understand that there there were some Buddhist influenced mendicants (probably the gorakhpanthis) that were around during Nanak’s time. It is still a great irony, though, that there was no direct continuity between the two traditions. The way I see it, Guru Nanak Dev Ji’s message of humanity, humility, and service towards others without expectation of anything in return is infact the essential continuity in GurSikhi and Buddha-Dharma. ਏਕ ਦ੍ਰਿਸਟਿ ਕਰਿ ਸਮਸਰਿ ਜਾਣੈ ਜੋਗੀ ਕਹੀਐ ਸੋਈ ॥੧॥ ਰਹਾਉ ॥, meaning: One who looks upon all with a single eye, and knows them to be one and the same – he alone is known as a Yogi. ||1||Pause||, SGGS ang 730). About Gorakh Panthis, I don’t know much about Nathism and their practices, but know that their meditative methods are selected parts of the more elaborate Vajrayana Buddhist tradition. The reason to my mind is that Buddhism had been wiped off for many centuries and hence the influence of Hinduism and Islam but not Buddhism. Not exactly. When Guru Nanak visited Ceylon, Buddhism was the order of the day. I hope I am quoting him correctly, but John Clark Archer, in “The Sikhs”, says “Buddhism, nevertheless, was in Nanak’s day the national religion of the island (Ceylon). Whether Raja Shivnath, who became a follower of Nanak was a Buddhist or follower of Shiva is being debated, but then Buddhism was very much alive and throbbing in Ceylon. Also, do not forget Tibet and Ladakh, where Guru Nanak went during his udasis. Regarding similarities, the concept of nirvana and sangat could be similar. I am not very sure about the Nanak’s purported visit to Ceylon. If it is based on the Janam sakhis, it is indeed questionable. Even otherwise, later Buddhism was a far cry from the early progressive era of Buddhism, as Kosambi noted in his essay on the Decline of Buddhism. When speaking of Buddhism, it is usual for non-Buddhists to view it in a generalised sort of way. The kind of Buddhism one may encounter in Sri Lanka, Thailand & Burma is quite different from the kind one would meet in Taiwan, Japan, Korea or Vietnam. And the kind of Buddhism one would encounter in Bhutan, Sikkim, Ladakh, Mongolia or Tibet is different again. While Buddhism is essentially non-theistic one has to consider what theism itself really is. Is the notion of God the same in Islam, Sikhism, Judaism and Christianity – or Hinduism for that matter? Is the Buddhist idea of a kind of “pregnant space or Mind” from which all arises and to which all returns and from which nothing is separate yet is distinct – any different from the Sikh “Sat Naam”? My impression is that Buddhism vanished from the Punjab through attrition being reabsorbed into Hinduism due to the fossilised monastic systems which separated the deeper knowledge and practices from the lay population and isolated it into introspective islands. The arrival of the Muslims finished them off. If Buddhism exists at all in Sikhism it would have to be in the form of ways of thinking and ways of seeing that would have appealed to the Jat ways of dealing with the world and which would have left them unconvinced by the Hindu fixation with caste and the fatalism inherent in that. The Buddha rejected the caste system long before Guru Nanak. You can see this attitude to some extent in the way the Tibetan exiles in India deal with their circumstances – there’s much they have in common with the Jats in their “have-a-go” attitude. To really see the Buddhist presence in the Sikh canon one would have to go past the “given” ways of understanding the gurbani and also gain some depth of understanding of the Buddhist “View” (particularly as in Vajrayana Buddhism). There really is more of the Buddha’s influence present in Sikhism than meets the naked eye, even if it is seen at first to be of Sufi origin (but that is another story…). Pritam: I don’t have enough depth in theological issues in either Buddhism or Sikhism to comment more on what the specific influences of Buddhism on the latter might be. However, I find your comments on the anti- caste nature of Sikhism quite interesting. My own two cents on this is that Sikhism is/was not an anti- caste religion. While in theory it did have a non- caste approach and partly blunted casteism in practice (e.g. langar), the fact that Nanak and the later gurus confined guru- dom within the Khatris as well as ensured endogamy in the lineage, makes its claim as an anti- caste religion contentious. The later dominance of the Jats (following Ranjit Singh’s consolidation of the misls) also indicates the continuing dominance of caste within the Sikhs. I would like to disagree with the authour on his assumptin that there are no similarities between Sikhism and Budhism. Firstly, the term “Sangat” in Sikhism is similar to the term “Sangha” in Budhism. Secondly, both religion shunned the practice of using Sanskrit and used the language of the people – Pali for Budhism and Gurmukhi for Sikhism. Lastly, the term “Buddha” refers to the knowledge and term “Guru” and “Sikh” are two side of the whell that results in knowledge transfer. Both religion rejected the Hindu practices of their time and the originator of both religions were Kshatriya (Khatri) and not Brahmin. I don’t think I have said that there are no similarities, if you can check the first para again, the reference is to lack of continuity/direct influence between the two. A small objection to the last point in your comment- the equivalence between the Kshatriya and Khatri castes is at best contentious.